We built Shop N Chill to enhance your online shopping experience by tailoring it to you (literally), and by making it easy for you to share the fun of shopping online with others. We respect privacy rights, and provide you with privacy tools to control your personal information, including sharing it. As a User of Shop N Chill, you create and control your profile and preferences, choose your Friends, decide what information to share and which shopping trips to experience with which Friends. website use information collected by us as you interact with our Website. When you register for Shop N Chill, you will be asked to provide your first and last name, and your birth date (for security purposes). You will also be asked to create a Screen Name (which will identify you to other Users of Shop N Chill), and to set up a password (to help us confirm that it�s you logging in). This is the minimum personal information that you must disclose to Shop N Chill to become a User and enjoy our services. Shop N Chill has many unique features that can tailor your online shopping experience to you - literally! To take advantage of Shop N Chill's features, further personal information may be required. We will let you know when our collection of further personal information is necessary to use a feature and when it is merely discretionary. For example, to buy something through Shop N Chill, we require your personal financial information to process your payment, and your address information to arrange for delivery. You may also choose to provide other information, such as your size, to optimize your shopping experience. When you enter our Website, we automatically collect information about how you use and interact with it, such as your IP address, browser type and language, access times, the referring website address, and the content of any undeleted "cookies" (described below) that your browser previously accepted. This information is gathered for all Shop N Chill visitors, and helps us improve everyone's online experience. In addition, we store certain information from your browser using "cookies." A cookie is a piece of data stored on the User's computer tied to information about the User. We use session ID cookies to confirm that Users are logged in. These cookies terminate once the User closes the browser. By default, we use a persistent cookie that stores your login ID (but not your password) to make it easier for you to login when you come back to Shop N Chill. You can remove or block this cookie using the settings in your browser if you want to disable this convenience feature. Shop N Chill is about sharing information and shopping with others while providing you with privacy settings that restrict other Users from accessing your information. We allow you to choose the information you provide to Friends and networks through Shop N Chill. Our network architecture and your privacy settings allow you to make informed choices about who has access to your information. Although we allow you to set privacy options that limit access to your pages, please be aware that no security measures are perfect or impenetrable. Your Screen Name is the only piece of information that you are required to share with all other Users of Shop N Chill. So pick your Screen Name carefully because it can enable or prevent others from finding you. By using the privacy settings on your Preferences page, you determine what information is private (and should be in your private profile), and what is shared with your Friends on Shop N Chill (and should be in your public profile). Information you disclose to Shop N Chill (other than financial information) becomes part of your private profile unless and until you delete it. You can delete information from your private profile at any time. Your Screen Name is also the only piece of information that defaults to become part of your public profile, so it will identify you to your Friends. Other than your Screen Name, you decide what information you want to share, and with whom you want to share it. You can change your privacy settings to specify other information you want to be displayed on your public profile. If your privacy settings are on, all Users of Shop N Chill can see your Screen Name, only your Friends can see your public profile, and only you and Shop N Chill can see your private profile. If you want all Users of Shop N Chill (and not just your Friends) to see your public profile, you can turn your privacy settings off. Without privacy settings, Users of Shop N Chill will be able to find you by searching for the information in your public profile, and connect with you easily. If you turn your privacy settings off, some elements of your public profile, may be made available to third party search engines. Shop N Chill also allows you to go on Shopping Trips with your Friends, send messages, perform searches and queries, consult a style expert, and transmit information through various channels. These experiences are shared with your Friends. Shop N Chill also has discussion forums. If you decide to post content on these forums, you do so at your own risk. If you choose to use our invitation service to tell a friend about our site and invite them to join, we will ask you for information needed to send the invitation, such as your Friend's email address. We will automatically send your Friend a one-time email or instant message inviting him or her to visit the site. Shop N Chill stores this information to send this one-time invitation, to register a Friend connection if your invitation is accepted, and to track the success of our referral program. Your Friend may contact us at info@ShopNChill.com to request that we remove this information from our database. Generally, we collect information so that we can provide you services and offer personalized and shared features. We may use information about you that we collect from other sources, including but not limited to newspapers and Internet sources such as blogs, instant messaging services, Shop N Chill Platform developers and other Users of Shop N Chill, to supplement your profile. Where such information is used, we generally allow you to specify in your privacy settings that you do not want this to be done or to take other actions that limit the connection of this information to your profile (e.g., removing photo tag links). We do not sell or otherwise provide your contact information to third party marketers without your permission. Our stores and services are offered jointly with the vendors on Shop N Chill, and we share customer information with that company when necessary for you to use of that store or service. Unlike most sites on the Web, Shop N Chill limits access to site information by third party search engine "crawlers" (e.g. Google, Yahoo, MSN, Ask). Shop N Chill takes action to block access by these engines to personal information beyond your name, profile picture, and limited aggregated data about your profile. We may provide information to service providers to help us bring you the services we offer. Specifically, we may use third parties to facilitate our business, such as to host the service at a co-location facility for servers, to send out email updates about Shop N Chill, to remove repetitive information from our User lists, to process payments for products or services, or to provide search results or links (including sponsored links). In connection with these offerings and business operations, our service providers may have access to your personal information for use for a limited time in connection with these business activities. Where we utilize third parties for the processing of any personal information, we implement reasonable contractual and technical protections limiting the use of that information to the Shop N Chill-specified purposes. From time to time, our service provides may be located in other jurisdictions; when this occurs, please be aware that authorities in these other jurisdictions may lawfully access your information. We occasionally provide demonstration accounts that allow non-Users a glimpse into the Shop N Chill world. Such accounts have only limited capabilities (e.g., messaging is disabled) and passwords are changed regularly to limit possible misuse. We may be required or requested to disclose User information pursuant to lawful requests, such as subpoenas or court orders, or in compliance with applicable laws. We do not reveal information until we have a good faith belief that an information request by law enforcement or private litigants meets applicable legal standards. Additionally, we may share account or other information when we believe it is necessary to comply with law, to protect our interests or property, to prevent fraud or other illegal activity perpetrated through the Shop N Chill service or using the Shop N Chill name, or to prevent imminent bodily harm. This may include sharing information with other companies, lawyers, agents or government agencies. We let you choose to share your information with the other websites owned by us. We also let you choose to share information with marketers or electronic commerce providers through sponsored groups or other on-site offers. Shop N Chill is a means of sharing actions you have taken on third party sites, such as when you make a purchase or post a review, with your Friends on Shop N Chill. In order to provide you as a Shop N Chill User with clear disclosure of the activity information being collected on third party sites and potentially shared with your Friends on Shop N Chill, we collect certain information from that site and present it to you after you have completed an action on that site. You have the choice to have Shop N Chill discard that information, or to share it with your Friends. Like many other websites that interact with third party sites, we may receive some information even if you are logged out from Shop N Chill, or that pertains to non-Shop N Chill Users, from those sites in conjunction with the technical operation of the system. In cases where Shop N Chill receives information on Users that are not logged in, or on non-Shop N Chill Users, we do not attempt to associate it with individual Shop N Chill accounts and will discard it. When you use Shop N Chill, certain information you post or share with third parties (e.g., a Friend or someone in your network), such as personal information, comments, messages, photos, videos, listings or other information, may be shared with other Users in accordance with the privacy settings you select. All such sharing of information is done at your own risk. Please keep in mind that if you disclose personal information in your profile or when posting comments, messages, photos, videos, Marketplace listings or other items, this information may become publicly available. We understand that security is key to protecting your privacy rights while online. Shop N Chill has put in place physical, technical, electronic and managerial procedures to safeguard the security, integrity of personal information, and when applicable, to safeguard its anonymity or confidentiality. We use encryption and other forms of technical protection to secure shopping transactions processed through our website. To protect the security of your information, each User has a User name and password* to access Shop N Chill. You are solely responsible for the security of your password, and must take precautions to keep it private to prevent any unauthorized use. Neither Shop N Chill nor any other person or entity will be responsible for any losses, damages or consequences suffered due to careless or unauthorized use of a password. We retain information for as long as necessary to fulfill its identified purposes. Once information has fulfilled its identified purposes, it is erased, anonymized or destroyed. We retain the information in your profiles for as long as you keep your profiles with us, or until we receive a request from you to remove it. In most cases, we retain your information so that, for instance, you can return to view prior messages you have sent or easily see your Friends. When you update information, we usually keep a backup copy of the prior version for a reasonable period of time to enable reversion to the prior version of that information. For split bills, we retain your financial information until the shared transaction is complete. For gifts, we retain information until the timeframe for returns has ended. Once your transaction is complete, and we have confirmation of successful delivery, we will only retain information if you have asked us to. Access and control over most personal information on Shop N Chill is readily available through the profile editing tools available on your Preferences page. 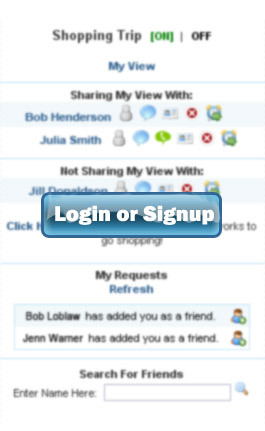 Shop N Chill Users may modify or delete any of their profile information at any time by logging into their account. Information will be updated immediately. Individuals who wish to deactivate their Shop N Chill account may do so on the account page. Removed information may persist in backup copies for a reasonable period of time but will not be generally available to Users of Shop N Chill. Where you make use of the communication features of the service to share information with other individuals on Shop N Chill, however, (e.g., sending a personal message to another Shop N Chill User) you generally cannot remove such communications. We encourage you to bookmark this page, and check back regularly. Visitors will find links from ShopNChill.com to independently owned, controlled and/or managed World Wide Web or Internet sites whose content we have found of possible interest to our visitors. While we initially visit these sites to which we directly link, we do not monitor or control the content that appears on these sites and such content may be constantly changing. Read the privacy policies of all linked sites before navigating through them. If you have a complaint about Shop N Chill's handling of your personal information, you may contact us at PrivacyOfficer@ShopNChill.com. We will do our best to resolve any outstanding issues in a positive and co-operative spirit, and in a prompt manner..
SHOP N CHILL RESERVES THE RIGHT TO UPDATE THIS POLICY. THIS POLICY WAS LAST UPDATED IN JUNE, 2008.